I often feel like an arrogant jerk when I walk into nearly any business and my brain starts figuring out ways that things could be improved by applying basic agile/lean principles to some process or another. I think I feel this way, because I’m obviously not the only person thinking here, so there often could be a very good reason for things being the way they are. That doesn’t mean that I’m not going to implement these types of changes within an organization where I work though. Here at Clear Measure’s Ohio office, I did one such thing. We often had questions about items that had never been purchased before. We often didn’t know who wrote the request, so there’s no easy way to ask for more input on the item. 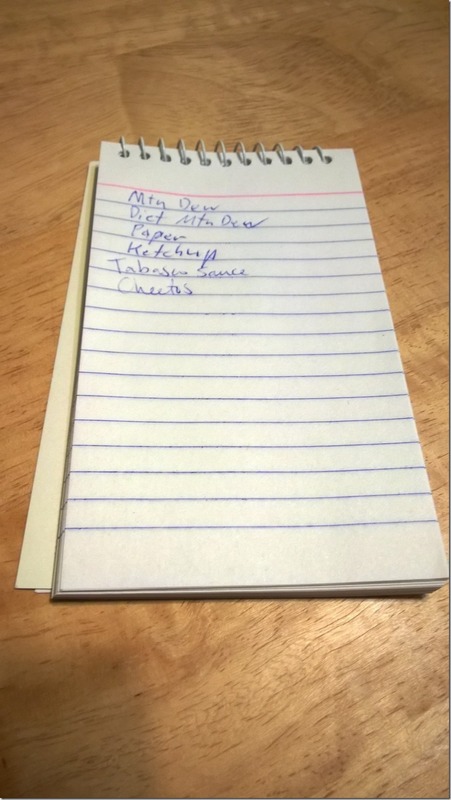 Additionally, if someone is running to the store, it’s easy to forget the items that are low, but aren’t on the list. These issues and more are why I’ve moved this whole system into Trello. What we love about this list is that we have a list of things we’ve ordered before, so that we can check that list for things we’re low on. It’s easy to make the request, and we can update this from our phones, computers, tablets, etc. It also lets you see who created a new card, so you can ask if there’s not enough detail to know what to order. It’s great for another reason for us as well. Many of our items are ordered online from the Austin office, so a physical piece of paper would be a challenge. 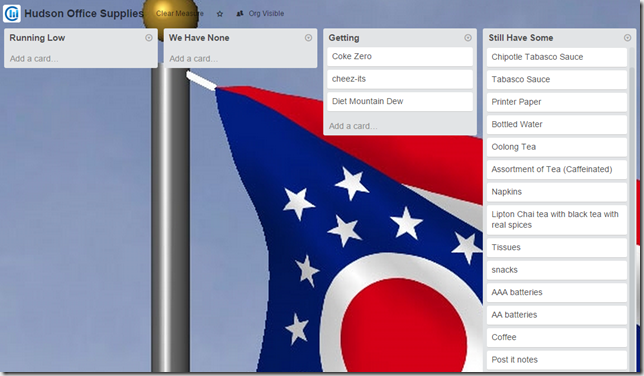 For you state or flag enthusiasts out there, that’s the Ohio flag in the background, so it’s really easy to tell that this is the list for the Hudson, Ohio office. Or as I imagine it’s commonly known by our Austin friends, Icicle Central.